Occasionally I collect hearts and create a collection with a grouping. 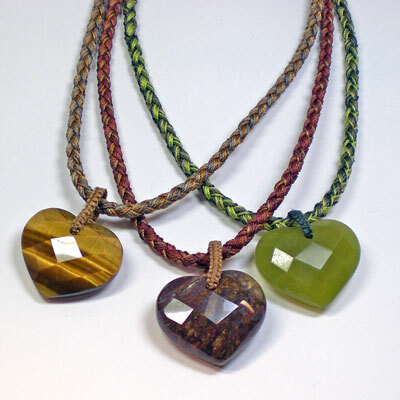 I just created this collection combining the hearts with a hand braided kumihimo cord made with a a combination of several colors. It adds to the complexity of the cord and compliments the hearts. The heart are 35mm wide by 30mm and 15mm in depth. The braids, 5mm in diameter, are hand braided with nylon thread. The clasps are sterling silver or gold filled trigger clasp. Some are oxidized to match the overall look of the piece.